1 About Assurity Life Assurity Life Insurance Company s origins are rooted in a century-long legacy of providing long-term security to policyholders that has earned generations of customers confidence and trust. 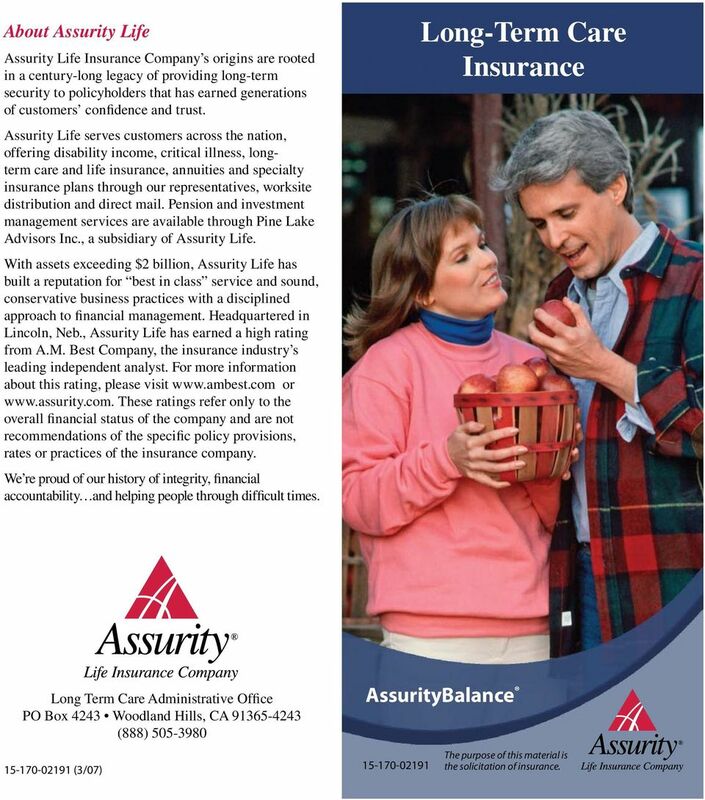 Assurity Life serves customers across the nation, offering disability income, critical illness, longterm care and life insurance, annuities and specialty insurance plans through our representatives, worksite distribution and direct mail. Pension and investment management services are available through Pine Lake Advisors Inc., a subsidiary of Assurity Life. With assets exceeding $2 billion, Assurity Life has built a reputation for best in class service and sound, conservative business practices with a disciplined approach to financial management. Headquartered in Lincoln, Neb., Assurity Life has earned a high rating from A.M. Best Company, the insurance industry s leading independent analyst. For more information about this rating, please visit or These ratings refer only to the overall financial status of the company and are not recommendations of the specific policy provisions, rates or practices of the insurance company. We re proud of our history of integrity, financial accountability and helping people through difficult times. Long-Term Care Insurance Long Term Care Administrative Office PO Box 4243 Woodland Hills, CA (888) (3/07) AssurityBalance The purpose of this material is the solicitation of insurance. 3 Help protect yourself, your family and your assets with AssurityBalance Long-Term Care Insurance. Our LTCI gives you two coverage options. Both options pay 100 percent of actual expenses up to your selected daily benefit. 1. Facility Care Only Option 1 (FC) Includes care in a nursing facility or assisted living facility. 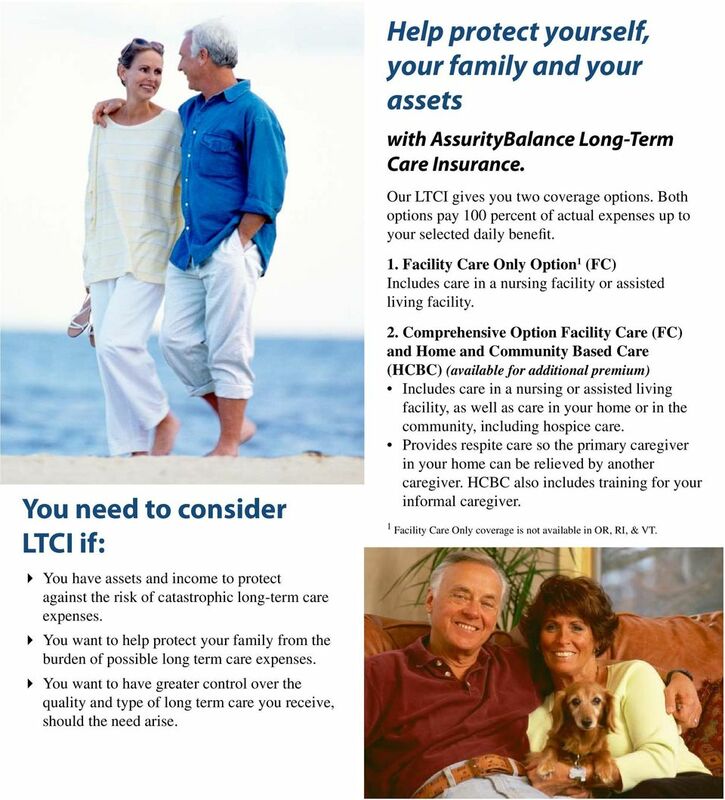 You need to consider LTCI if: You have assets and income to protect against the risk of catastrophic long-term care expenses. You want to help protect your family from the burden of possible long term care expenses. You want to have greater control over the quality and type of long term care you receive, should the need arise. 2. Comprehensive Option Facility Care (FC) and Home and Community Based Care (HCBC) (available for additional premium) Includes care in a nursing or assisted living facility, as well as care in your home or in the community, including hospice care. Provides respite care so the primary caregiver in your home can be relieved by another caregiver. HCBC also includes training for your informal caregiver. 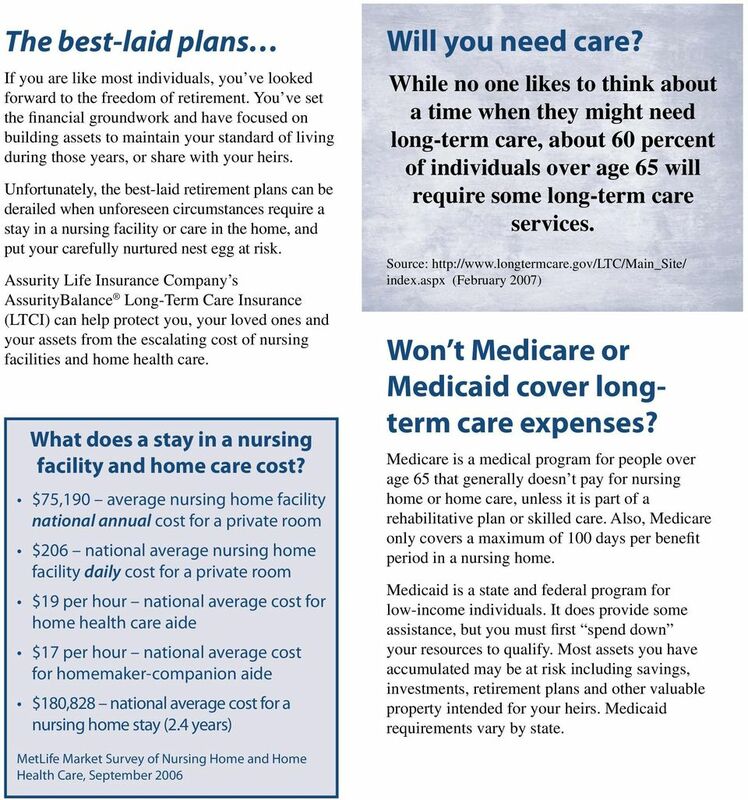 1 Facility Care Only coverage is not available in OR, RI, & VT.
4 LTCI Policy Highlights Our LTCI policy offers some of the best, most wide ranging benefits in the industry. The following benefits are included in both the Facility Care Only Option and the Comprehensive Option at no extra cost: Waiver of Premium/Joint Waiver of Premium Premium payments for the entire policy are waived when you or a second insured are confined to a nursing or assisted living facility for 90 days. The Joint Waiver of Premium waives the total premium even when only one insured is confined. Bed Reservation If you are temporarily absent from a care facility, charges will be paid, up to your daily benefit, to secure your bed for up to 30 days per calendar year. Alternative Plan of Care If agreed upon by you, your licensed health care provider and Assurity Life Insurance Company, an Alternative Plan of Care may be developed in order to provide for Qualified Long Term Care Services not specifically shown as being available under the policy (such as equipment purchases or rentals). Optional Personal Care Advisor We ll provide a personal care advisor to answer your questions about benefits eligibility, levels of care, facility availability and service resources. There is no deduction from your benefit pool for this service. Optional Care Coordination At your request, we will provide a care coordinator a registered nurse, who can help develop a plan of care, arrange monitoring service and complete claims documentation. There is no deduction from your benefit pool for this service. Guaranteed Renewable for Life As long as you continue to pay your premiums on time, we will never cancel, refuse to renew or place restrictive riders on your coverage after it has been issued. However, we can modify the premium if we make the same adjustments for all covered persons in a state under the same class. 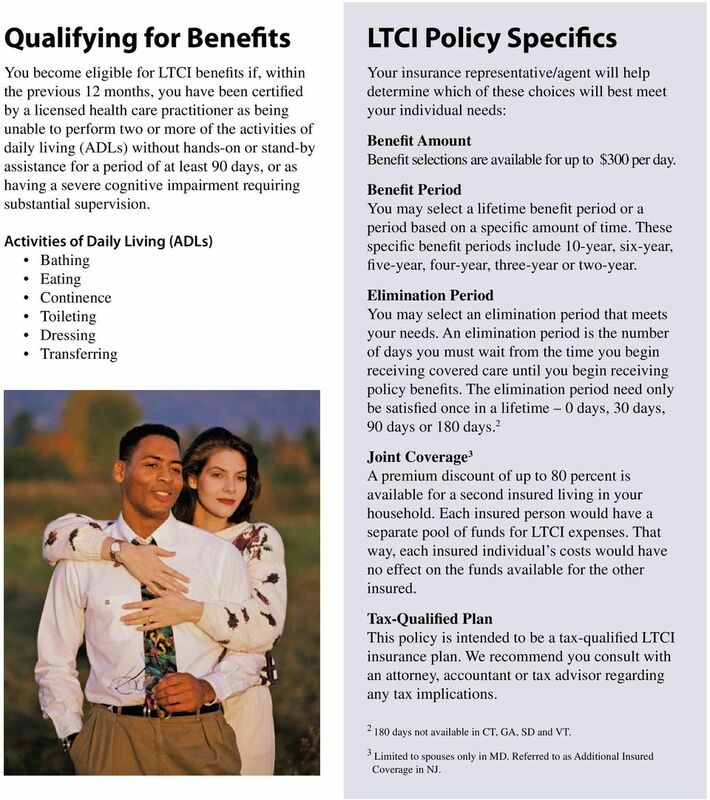 5 Qualifying for Benefits You become eligible for LTCI benefits if, within the previous 12 months, you have been certified by a licensed health care practitioner as being unable to perform two or more of the activities of daily living (ADLs) without hands-on or stand-by assistance for a period of at least 90 days, or as having a severe cognitive impairment requiring substantial supervision. 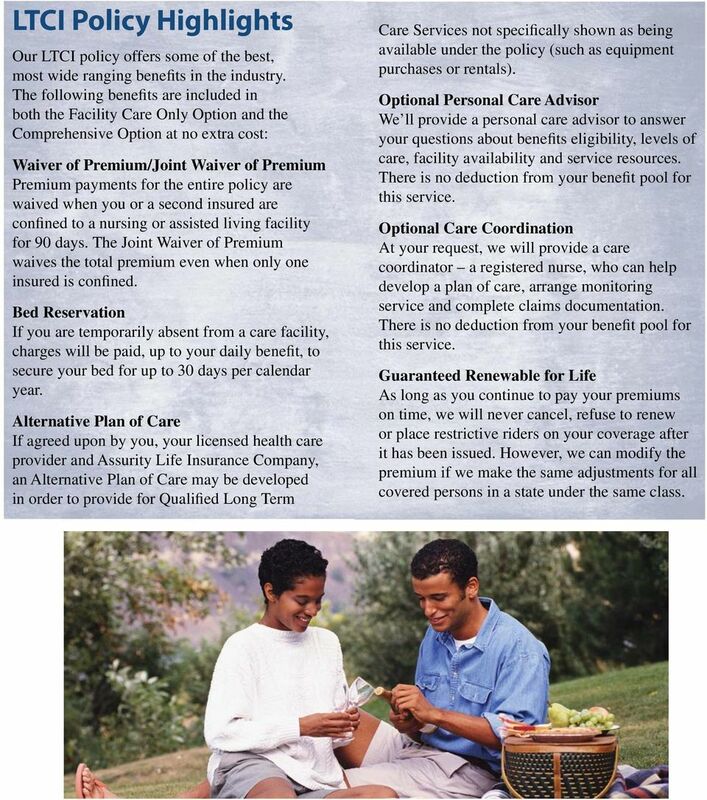 Activities of Daily Living (ADLs) Bathing Eating Continence Toileting Dressing Transferring LTCI Policy Specifics Your insurance representative/agent will help determine which of these choices will best meet your individual needs: Benefit Amount Benefit selections are available for up to $300 per day. Benefit Period You may select a lifetime benefit period or a period based on a specific amount of time. These specific benefit periods include 10-year, six-year, five-year, four-year, three-year or two-year. Elimination Period You may select an elimination period that meets your needs. 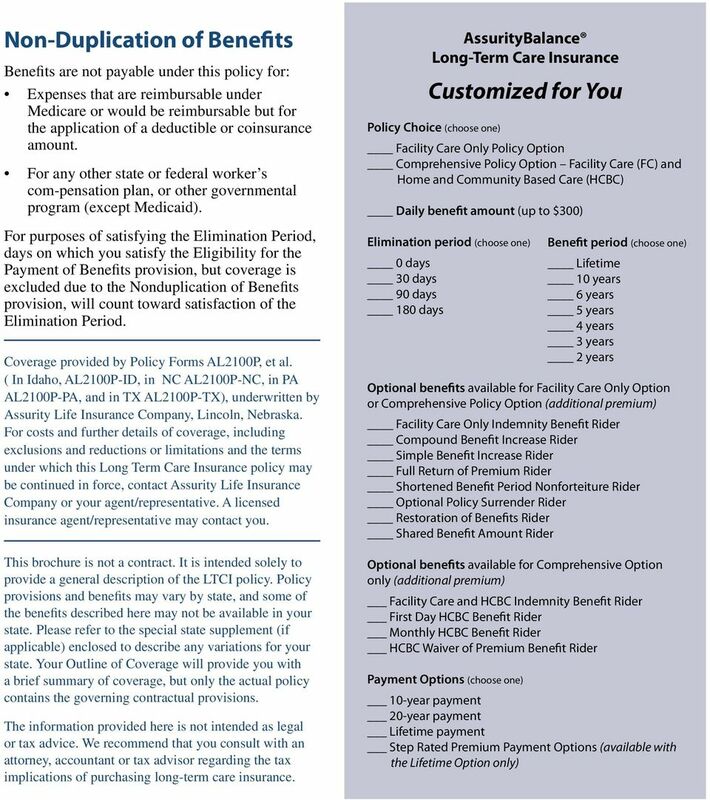 An elimination period is the number of days you must wait from the time you begin receiving covered care until you begin receiving policy benefits. The elimination period need only be satisfied once in a lifetime 0 days, 30 days, 90 days or 180 days. 2 Joint Coverage 3 A premium discount of up to 80 percent is available for a second insured living in your household. Each insured person would have a separate pool of funds for LTCI expenses. That way, each insured individual s costs would have no effect on the funds available for the other insured. Tax-Qualified Plan This policy is intended to be a tax-qualified LTCI insurance plan. We recommend you consult with an attorney, accountant or tax advisor regarding any tax implications days not available in CT, GA, SD and VT. 3 Limited to spouses only in MD. Referred to as Additional Insured Coverage in NJ. 6 Optional LTCI Riders We offer a variety of riders so the LTCI policy can be customized especially for you. These optional riders are available for an additional premium. The cost of these riders varies based on issue age, premium payment option, elimination period and benefit period. 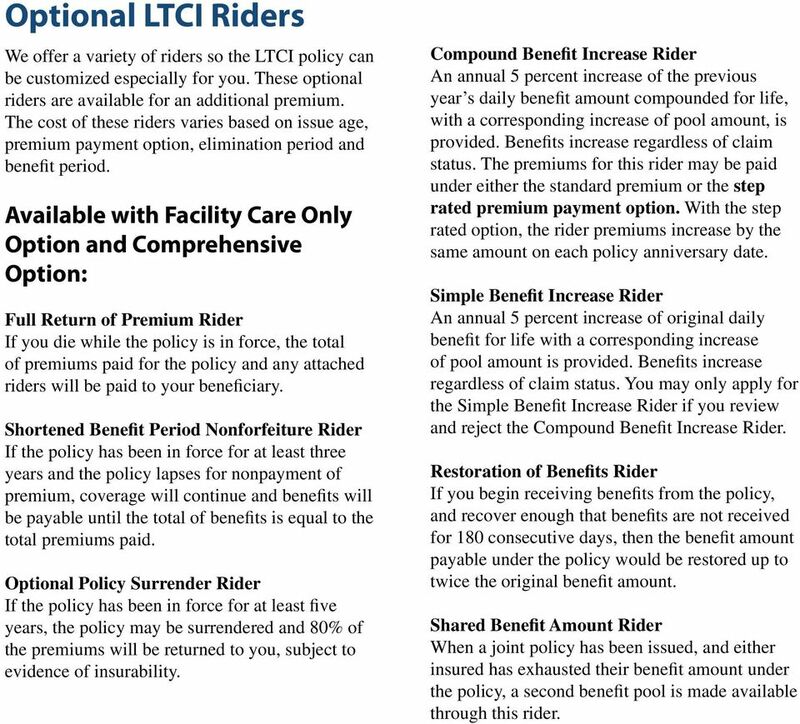 Available with Facility Care Only Option and Comprehensive Option: Full Return of Premium Rider If you die while the policy is in force, the total of premiums paid for the policy and any attached riders will be paid to your beneficiary. Shortened Benefit Period Nonforfeiture Rider If the policy has been in force for at least three years and the policy lapses for nonpayment of premium, coverage will continue and benefits will be payable until the total of benefits is equal to the total premiums paid. Optional Policy Surrender Rider If the policy has been in force for at least five years, the policy may be surrendered and 80% of the premiums will be returned to you, subject to evidence of insurability. Compound Benefit Increase Rider An annual 5 percent increase of the previous year s daily benefit amount compounded for life, with a corresponding increase of pool amount, is provided. Benefits increase regardless of claim status. The premiums for this rider may be paid under either the standard premium or the step rated premium payment option. With the step rated option, the rider premiums increase by the same amount on each policy anniversary date. 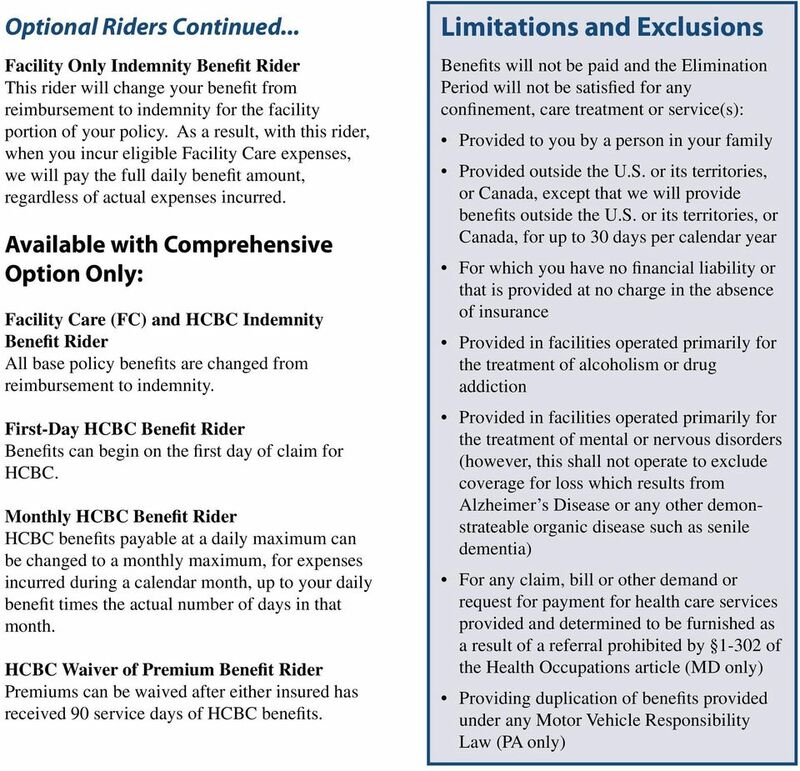 Simple Benefit Increase Rider An annual 5 percent increase of original daily benefit for life with a corresponding increase of pool amount is provided. Benefits increase regardless of claim status. You may only apply for the Simple Benefit Increase Rider if you review and reject the Compound Benefit Increase Rider. Restoration of Benefits Rider If you begin receiving benefits from the policy, and recover enough that benefits are not received for 180 consecutive days, then the benefit amount payable under the policy would be restored up to twice the original benefit amount. Shared Benefit Amount Rider When a joint policy has been issued, and either insured has exhausted their benefit amount under the policy, a second benefit pool is made available through this rider.